Hon. Robert F. Godec has been sworn in as the ambassador to Kenya. Ambassador Godec was sworn in by US Secretary of State Hilary Rodham Clinton. According to the US State Department, Ambassador Godec served in numerous senior positions within the Department of State in Washington, was U.S. Ambassador to Tunisia from 2006 to 2009 and also served at the U.S. Embassy in Nairobi from 1996 to 1999. Robert F. Godec is currently the Principal Deputy Coordinator for Counterterrorism in the Department of State. From 2006 to 2009, he served as U.S. Ambassador to Tunisia. Ambassador Godec has also served as a Deputy Assistant Secretary in the Bureau of Near Eastern Affairs and was Deputy Coordinator for the Transition in Iraq, charged with organizing the transition of policy and operational elements of the Coalition Provisional Authority and the standup of U.S. Mission Iraq. 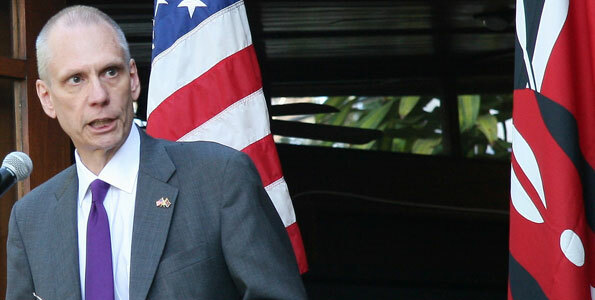 Prior to his work on Iraq, Ambassador Godec was Acting Deputy Chief of Mission and Minister Counselor for Economic Affairs at U.S. Embassy Pretoria, South Africa. He has also served as Economic Counselor at U.S. Embassy Nairobi, Kenya, Assistant Office Director for Thailand and Burma in the Bureau of East Asian and Pacific Affairs, and Director for Southeast Asian Affairs at the Office of the U.S. Trade Representative. Before joining the Foreign Service in 1985, Ambassador Godec earned a Master of Arts degree in International Relations from Yale University as well as a Bachelor of Arts degree in Foreign Affairs from the University of Virginia. He attended the State Department’s Senior Seminar and has received a Distinguished Honor Award and numerous other awards and commendations. Ambassador Godec speaks French and German. The upcoming March 2013 election is the next key moment for Kenya in the implementation of its new constitution and in advancing political reform. The responsibility for the election rests squarely with the Kenyan government and people, and success, frankly, is not assured. If I am confirmed, one of my top priorities will be to support Kenyan efforts to make the election free, fair, and peaceful. We have a strong and varied set of programs in place to assist institutions charged with carrying out the most complex election in Kenya’s history. We are working with government, civil society, religious leaders, community leaders, and youth across the country to promote peaceful participation in the election. With the nomination, confirmation and now having been sworn as US Ambassador to Kenya, let’s hope this career diplomat who has previously served in the country can do as he has outlined above for that’s all we ask him at the base level. His first order of business ought to make it clear what the consequences of electing Uhuru and Ruto shall be for the country from the United States’ perspective and not take the usual middle, dodgy and going to the extreme not to offend anyone or raise eye-brows on matters such as this as most a diplomats are wont to do. To her credit, though, outgoing US Secretary of State and Godic’s boss, Hillary Clinton, made it clear in basically reading the riot’s act to Kibaki–according to leaked reports from the closed-door meeting, that it would not be business as usual were Uhuru or Ruto allowed to vie and are elected to office. Publicly, the US hasn’t said much, though, weighing the situation as it evolves before doing so. That kind of silence or muddled pronouncements is exactly what we don’t need at this time. There are times where clarity of purpose and objectives must be made clear and in no uncertain terms. Nothing cries for just that other than this ICC situation. I commend the UK envoy to Kenya Christian Turner who made it clear the other day the UK will not have anything to do with Uhuru or Ruto in the unfortunate circumstance either or both are elected as president and vice-president, the new US envoy should do the same and ditto for all other envoys so it’s even more clear to all that it’s not business as usual in Kenya anymore as these two ICC indictees seem to think or want others to believe. We are way past this exploitation of people’s lack of information, poverty and tribalism to advance narrow and selfish agendas as Uhuru and Ruto are clearly pursuing.